Looking good there, nice to see progress and its better when you get to run trains. I like your idea of lifting the boards, I have made my new layout modular so I can turn the board on its side fairly easily to get to the wiring. A mistake I made with my last layout was it was too big and I had to crawl underneath, I am getting too old for that. Regarding swmbo, mine seems to think I do nothing all day since I retired, she has not made a list but its early days yet I have only been retired two years. Hello Bob, this is all looking good, I envy the space you have which permits a lot more options. Despite dismantling and altering Geominster I decided that it is time to start again. 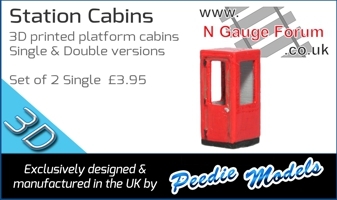 As this was my first venture into N Gauge as you can imagine a huge amount of lessons have been learned, too many to repeat really. Anyway a new plan is being drawn up with a board size approximately 3200m x 800mm at the widest part, due to sweeping curved lines along the front the board will be shaped accordingly giving more room space. One huge lesson learned was with point motors, little beggars took forever to line up by using the plastic base plates, this time they will be firmly attached to the point and a hole drilled to pass the motor through, simples really and the test one is so much more positive when it throws. I think your idea of modular removable scenery sounds a good idea and something I am also considering. I have a huge pile of mountboard approximately 2mm thick I can use as the base, if you want some you are more than welcome. I am not going to progress the new layout here but will probably diary it on the website. I will keep you informed. All the best keep in touch and we will catch up soon. Geominster was my first project which has now been dismantled. Having learnt so much from Geominster this is the new project. Thats a nice size area you have for your layout. I look forward to seeing your plan. I'm using Seep PM4 point motors (not installed yet!!) but they will be spaced away from the point actuator by about 2.5cm and operating through a 6mm hole in the baseboard. I built a test piece up to try this out and found that at 2.5cm away from the point there is enough force to easily actuate the point and enough flex in the operating rod for the point motor to go through its full travel. This means the switch on the point motor operates reliably and the PM4 version is fitted with an over centre spring which holds the switch at each extreme. This should make setting up the motor much less fiddly. - That's the theory anyway, I guess I'll find out if it works reliably in the next few weeks!! Track laying still progressing steadily but slowly. I figure that It's worth spending time getting this right to avoid problems later. I'll crack on and do a bit more today. More track laying progress today. Nearly finished the main station and goods yard complex. Tested with my very free running Farish Mk 1 coach and not a hiccup around the track and all the points. Just a very satisfying clackety clack across all the points. I now have to lay the loco depot and the other main station (otherwise known as the visible fiddle yard). This second main station will be portrayed as a preserved station under construction. Finally there's a bit of track to lay for the branch line. Now I've figured out how to avoid most of the pitfalls I'm finding things much easier. Xuron track cutters are brilliant. I use a block of wood to keep the cutters vertical for a square cut. Peco insulated rail joiners are useless unless the join is in a straight line. Laying the track on a full size plan makes things much easier IMHO. Taking into account other commitments I should get the track laying complete by the end of next week Then I'll post piccies. Noooooo going to sleep with the light on now. Oh but we aren't allowed jokes and fun on here someone got the 'ump. Thoughts of suspenders are suspended for tonight. It's enough to put you off the suspense of inserting your next track pin!! Another 2 or 3 hours of tracklaying today. Pleased with progress. Unfortunately I noticed that some of the tracks on the second terminus/exposed fiddle yard (right hand baseboard) were a little too close together so I'm currently trying to figure out the best way to modify the track plan to get things to fit properly. I'm surprised all you folks out there didn't notice and tell me what a pratt I am for missing this little error. Anyway, I think I've sussed it out now but will leave it till the morrow to check fully. Ohhh Deeeear!! George - take a Valium my friend and watch a soap or two. That'll send you to sleep and eventually you will get over this trauma. Page created in 0.314 seconds with 40 queries.